Tom Compton, the personality behind AnalyticCycling.com, believes trainers do a shabby job of simulating outdoor riding conditions. There's that something missing in them. Well, nothing new there, as most of us have felt the same since time immemorial. We all sit on these mechanisms and fool our brains into thinking we're doing the actual thing. "Acceleration is the root cause of the difference (between actually riding outdoors on bicycles and indoors on trainers). Trainers model average power at constant speed and don't respond realistically to accelerations. So when you get up to sprint on a trainer, the pedal 'falls out from under you'. The acceleration of a trainer is wrong, wrong by as much as several orders of magnitude. 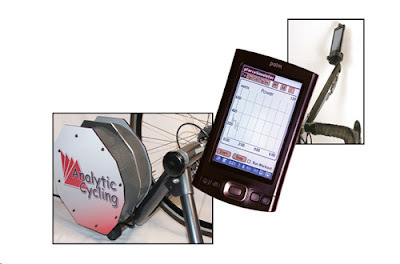 After all, the mass of even a large-flywheel trainer is small compared to the mass of a rider." Compton is now taking trainers one step forward with a cool add-on simulator that mimics real world riding conditions indoors. How do you simulate real world conditions? It turns out that its all in the resistance force encountered at the pedals. Compton has designed a one package solution, called Pedal Force Simulator (PFS), through which riders can select a pre-programmed force simulator in a Palm device mounted on the handlebars. 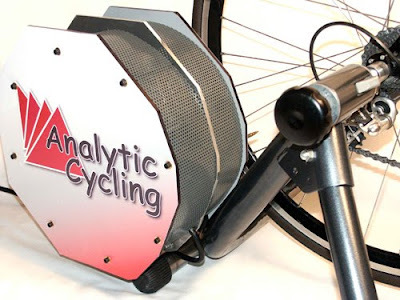 The simulation model is then communicated wireless to a computer at the rear wheel which then controls the pedaling resistance at about 1000 times per second. The power of this system comes in customization and as said before, in mimicking outdoor variables. 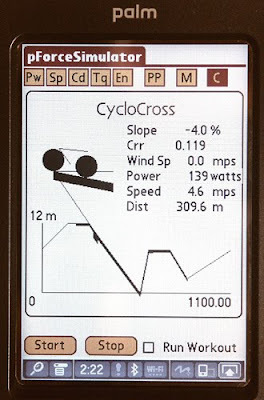 While there are pre-programmed courses in the simulator, a rider can also setup any ride profile he desires into the computer. Moreover, the PFS takes wind speed and direction as selected by the rider and transforms it in a way that gives realistic outdoor increases and decreases in wind speed which translates to a more realistic "windy" riding experience. As the wind is varied during the ride based on the model, the rider may feel necessary to shift into easier gears to pedal, just like in the real world. After having built complete prototypes, all true and tested, Compton is now offering licensing of the technology. In short, what is claimed by Compton is that the Pedal Force Simulator gets the instantaneous acceleration right. This affects the rider's ability to put power into the pedals and hence, captures real and subtle effects that one will never obtain on a trainer.